There is something magical about a warm, freshly made batch of playdough that takes me right back to my own childhood. It was a staple at my house when I was a child and it is weaved into many of my childhood memories. When I became a teacher, I discovered all the glorious educational and developmental benefits that occur through simply playing with it. 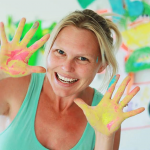 It’s no surprise that when I became a Mum myself I went a little nuts making it – we have at least 3 different colours in the fridge at all times! 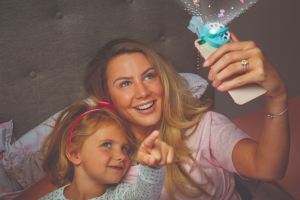 It’s so open ended, and with 4 children of my own now (aged 5, 4, 2.5 and 6 months old) anything that I can set up that entertains all 4 (well…the older 3 at least!) ticks all the boxes for me. 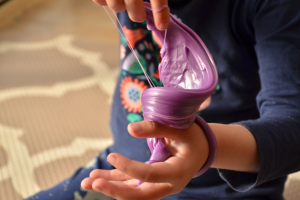 Strengthening little hands and fingers for writing is as simple as rolling playdough! It can also help develop vocabulary and explore numeracy concepts (long, short, thick, thin). 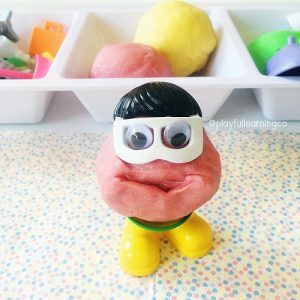 Learn body parts and develop spatial awareness by adding Mr Potato head parts to playdough! This opens up a world of possibilities for play – and is a calming sensory experience after a long day of school, or in those few hours before bed time. Mr Playdough head and his mates often visit our place after school! This quite possibly is my 2 year old’s favourite way to play with playdough! The inevitable pink playdough stations are a hot favourite but I often offer yellow ones as my little girl says ‘ye-yoh’ for yellow. Providing an engaging medium to repeat words can help model correct articulation – and is a whole heap nicer than saying ‘NO, it’s yeLLow!’. 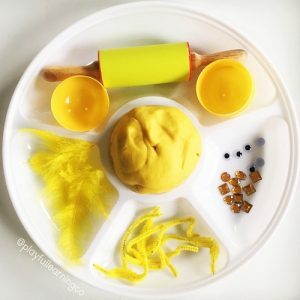 Adding different items to playdough also encourages flexibility in thinking, planning and reflecting and, of course, encourages creativity and imagination. 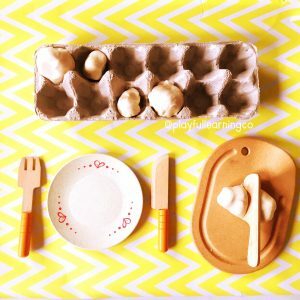 It is a fantastic way of giving new life to items that they may not have played with for awhile. A quick note: googly eyes make EVERYTHING fun, but just be mindful of your child – you know them best! Do not offer small items for play if you know they are still putting things in their mouth. Safety first! 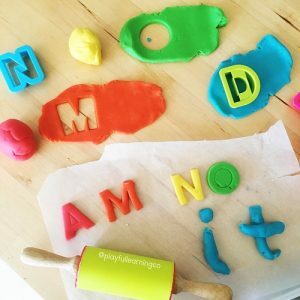 Making letters and words out of playdough is a favourite and hands-on way of spelling at our place and was loved by hundreds of children that I have taught over the years. Invite children to make words (or individual sounds / letters of their name depending on where they’re at). If you don’t have alphabet stampers, no worries! 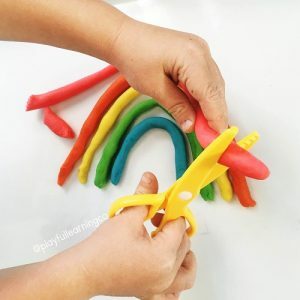 Encourage them to roll out the playdough into snakes and form letters that way – this is fantastic for their finger skills. If you are using letter stampers, try popping the letters in the freezer to make it easier to move the letters around without breaking them. Rolling and flattening out cold and partially frozen playdough also adds an extra fine motor workout. Plus it’s a cool investigation – the dough doesn’t freeze due to the high salt content! Try it for yourself. Does your child need help recognising what a word is? Enter playdough! This little set up can help children differentiate between sounds, words and sentences. First, make a simple sentence. 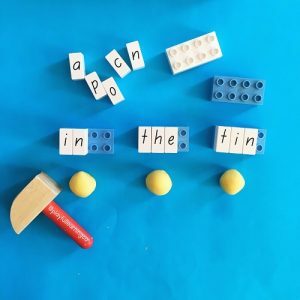 In this case, we made the sentence ‘In the tin’ with some lego letters. (Do not worry if you don’t have these – writing them on paper would be just as effective.) Roll one little ball of playdough per word as pictured. When your child reads the words, encourage them to say the speech sound in each one and then BAM the dough with a hammer to blend these speech sounds together! /i/ /n/ “IN!” (BAM dough with hammer). Focus on letter sounds, not names. Once this has been done for each word, smoothly read each word to say the sentence. In my experience, this has been incredibly motivating, particularly for little boys who love to BANG! 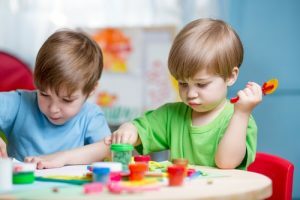 Writing in playdough can help provide valuable sensory input for little people who are still working out how hard to press their pencils when writing. For this one, we made a pirate treasure chest out of an egg carton and made some alphabet treasure coins. I asked my school-aged boy to choose three coins and blend the sounds the letters make together. I asked him, ‘did you make a real word or a nonsense word?’ I then asked him to stick the coins into the playdough and write the words with a matchstick (or another type of stick if the matchstick is too flimsy). Definitely more fun than look, cover, write, check! Hide some objects, like pirate coins or real coins into playdough and ask your child to find these objects. Once they have found them, ask them to place these items in the palm of one hand. Encourage them to move the object in the palm of their hand to the tips of their fingers and thumb. Once here, get them to post it into a money box or an empty box with a slit in the top. This is a different version of the last game, except this version adds in literacy skills – ticking homework off the list in a fun way (we’re all about playful learning at my place!). 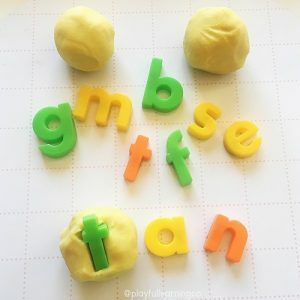 Hide 3 or 4 letters (magnetic letters will do) into balls of playdough. Encourage your child to find the letters and work out what the word could be! My boys love it when I take it in turns with them – they love being teacher, hiding a secret word in the dough for me to discover. This also provides a great opportunity for me to model how to sound out words, reinforcing what they’ve been doing at school. We also have races, with each of us having a ball of dough with ‘mystery’ letters in it – the first one to find the letters and make the word is a winner! Try Baby Hints and Tips recipes for edible playdough and the softest playdough ever. This is just a teeny tiny insight into the amazing possibilities of playdough! 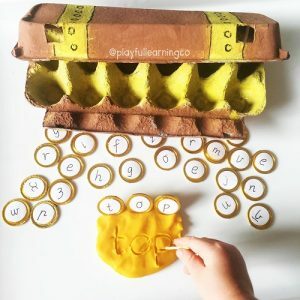 Come and check out my Instagram feed (@playfullearningco) for more fun and playful ideas! I am a Mum of 4 little blondies (5 and under), a teacher-on-leave and Education Award winner; currently living in the Red Dirt of Australia's North West. I love playful learning, mess making and colour! Find Amy at Instagram @earlylearning101 and Instagram @playfullearningco.